Today is the eighth day of the twelfth month. In Japanese, that’s what Rohatsu means. Why is that important? Because it’s also Bodhi day. This is the day where Buddhists commemorate the historical Buddha gaining enlightenment. The Buddha had spent the previous few years living a life of extreme asceticism where he practically starved himself to death trying to gain an understanding of why there is suffering and death. 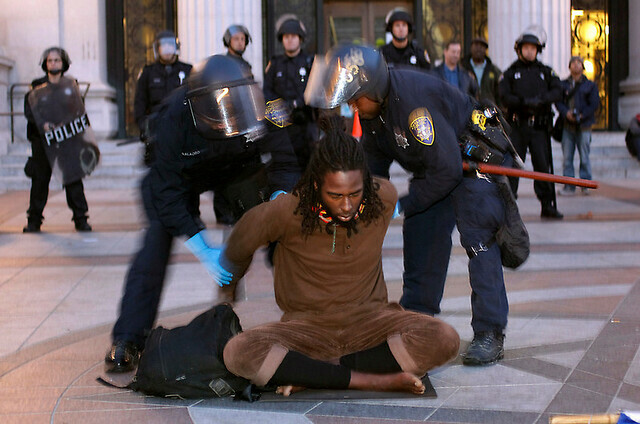 Before that, he had spent years studying meditation and spiritual matters. He had been so successful in those studies that he was asked to take over the schools of his teachers. He chose not to follow that path either as studying deeply did not answer his question. Eventually, after having tried extreme spiritual practices and extreme ascetic practices he realized that the answers he was looking for were not to be found there. This is when he realized that there had to be a better path, what became known as the Middle Way—avoiding extreme materialism or asceticism. At that point, the story goes, he decided to sit under a Bodhi tree and meditate until the problems of suffering and death were finally solved. According to many accounts, he sat for 49 days in meditation and finally received enlightenment and the Four Noble Truths and the Eightfold Path were revealed. As will happen with any tradition that is over 2000 years old, a lot of other stuff gets added on and the historical accuracy of some of the stories can often be hard to come by. Whether this is a completely accurate account of what happened or not, it’s been a consistent enough story for two and a half millennium that I feel comfortable with the story as it is traditionally told. 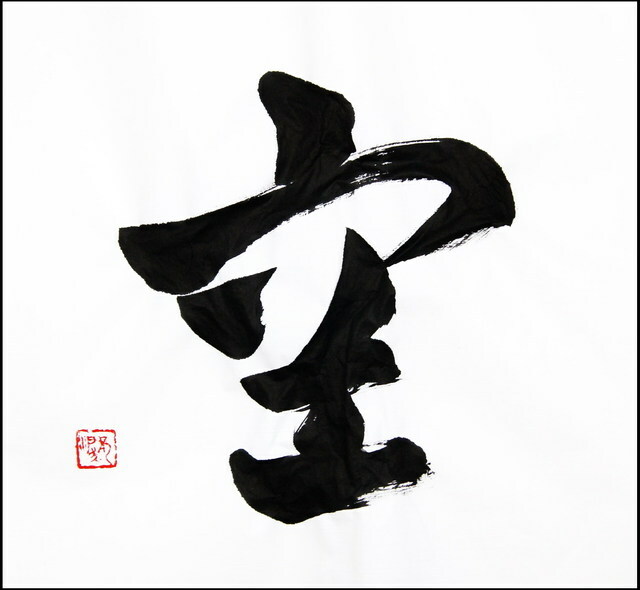 For me, Rohatsu is special because it reminds me of the importance of the Middle Way. I have found in my own life that this is extremely important. I have tried dealing with my suffering through excess indulgence. All it got me was an extra hundred pounds of fat. I have tried living a life of extreme spirituality and found it to be lacking and unfulfilling. When I walk the Middle Way, I find balance and peace. I may never gain enlightenment but I can still walk the path and follow the teachings. I can meditate and choose to live a life in peace and harmony with the world around me. In this I have found a way that makes sense, a way that actually addresses life just as it is, a way that doesn’t push me to extremes of imbalance. I will go through today and keep in mind the importance of walking the Middle Way and of pursuing it until I find the way to save all sentient beings from suffering. On another note, Rohatsu is in December so, when someone wishes me Happy Holidays, I consider this to be the one they’re wishing me happiness for. What holiday you choose to be happy on is up to you. I found these images to be very moving. There have been a number of times when I have heard Buddhists being accused of not being active in addressing social problems. While I do not necessarily agree with that accusation, I do understand how it can sometimes appear that this is the case. After all, when you see someone meditating, it’s not all that exciting. If you have not meditated, you could ask quite reasonably what is the point of it. However, if you have or have ever had, a regular meditation practice you understand that meditation is a powerful tool for transformation. Through the act of meditation, you are forced to confront your own mind and you begin to cut through the illusions that our minds construct to define the world. The important part is that, when you leave the meditation cushion, you take that clarity and insight with you. An active meditation practice means that you have an active interest in transforming the entire world. When I am more aware of the way my mind works, I am more prepared to deal with others in a way that is less self-serving. I see others in a more positive light and am more concerned for their well being. The clarity that one gets from meditation can and does put you in a place where you want to help everyone possible. Meditation is powerful action that we can take to bring about change. As you view the pictures above, consider the emotional impact that they have. 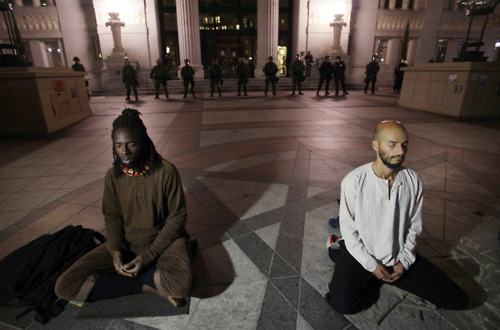 These two men (there were others meditating also) are making a powerful statement without saying a thing or raising a hand against anyone. 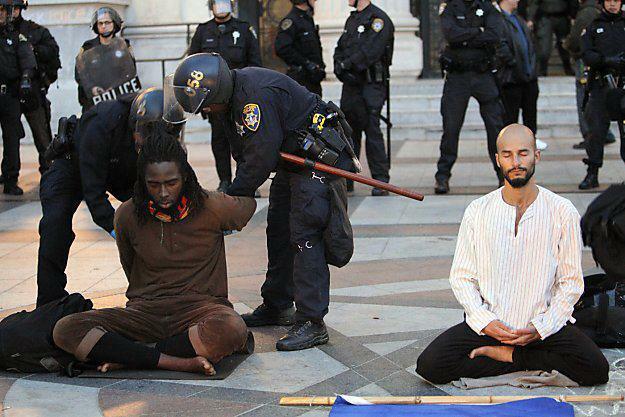 I look at this picture and wonder if I would be able to sit in meditation while the person sitting next to me was being arrested, all the while knowing I was next. Probably not. If you have never meditated, I highly recommend giving it a chance. Find a quiet place and sit in whatever way you are most comfortable. Allow yourself to relax and focus on your breathing. Allow your mind to do what it will. Eventually it will quiet down (a bit). Keep focused on your breathing and clear your mind. Even 5 minutes is enough to get started. Eventually, you will start to see small, positive changes taking place in your understanding and your outlook. Then, you’ll understand just how important an activity meditation can be. I’m sitting here in the early morning, drinking my coffee and watching the sun come up. It’s slightly foggy outside so everything is just a little soft around the edges. The fog is catching and reflecting the colors of the sunrise and generally making this a beautiful morning. In a very short while, the fog will burn off and we’ll have a clear, crisp autumn day. The way the fog is behaving reminds me of something that is said in our school about keeping a clear mind. A clear mind is like a mirror, when red shows up, the mirror is red, when blue shows up the mirror is blue. A clear mind reflects whatever is in front of it at that time. That’s what this fog is doing. Reds and yellows and oranges come and the fog reflects reds and yellows and oranges. When I see this, I find great beauty in it. Why do I find beauty in it? Fog is usually something that has negative associations. If someone is feeling foggy, it’s a bad thing. If someone is confused, we say they’re in a fog. Yet here I am enjoying the beauty of this early morning fog. I am finding beauty in it because the fog is doing what it is supposed to do. It is reflecting whatever light hits it. A clear mind is also a thing of beauty. It reflects the world around it and does not interfere with it. When we encounter clear mind, we encounter beauty. I think this is because we innately admire a thing when it simply does what it is intended to do. A clear mind is not a complicated thing. A clear mind is easy to understand. A clear mind is what it is without pretense or posturing. 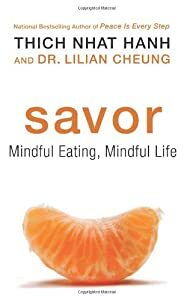 A clear mind eats when it is hungry and stops when it is full. A clear mind does not feel the need to dip into a pint of ice cream to change its mood. A clear mind doesn’t have “moods” in the way that we understand them. This is why I spend 40 minutes a day in meditation: to develop a clear mind. And now, with my mind clear from my morning meditation and my morning coffee (hey, drinking coffee can be a type of meditation too!) I am ready to go out into the day and face each moment as it comes. One of the benefits of sitting meditation is that it forces one to face the mind and how it works. When you are sitting quietly, your mind is given unfettered access to your attention. When this happens, it becomes like a little puppy who just wants to run and play and chase squirrels and pee on everything it sees. It’s only after some experience with meditation that some measure of control over the mind is gained. The puppy needs to be trained and learn to heel and not run off and not pee on everything. It’s hard work and often surprises newcomers to meditation just how challenging it can be to sit quietly and keep a clear mind. Why is keeping a clear mind important? Because all of our suffering can be traced back to the mind as the source for all suffering. Our minds tell us that something is good or bad, pretty or ugly, smells good or bad, is nice or unpleasant or useful or not. Another function of the mind is to act as a DJ, spinning thoughts and memories around and around without stopping. When you combine these two functions, judging everything and looping through thoughts, you end up with an ideal recipe for suffering. How? It’s quite simple. First, the DJ picks a memory out of its huge collection. It puts it on and gives it a spin, then the judging part of the mind kicks into gear and all of a sudden you’re giving context to the thought: “I like this”, “I don’t like that”, “that was a great experience”, “why did I say that? !”, “I should do that again”, “I hope I never do that again”, “I’m so embarrassed by that”, etc. Before you know it, you’re out on the dance floor and the DJ is going to keep you dancing all night long. As you go through this process over and over and over, it begins to take its toll on you. As you construct scenarios in your mind to replay the good thoughts or avoid the bad ones you plant the seeds of suffering. If you have a good thought, you’ll suffer when it’s over. If you have a bad thought, you suffer because of it. Rinse, repeat. As you sit in meditation, this dance becomes easier to observe. Meditation allows you transition from being a dancer to a chaperon trying to keep order over the dancers. It’s at this point that the rules that make up the dance become clearer. There are three ways that the mind reacts to thoughts cause the dance to go on. All three add to suffering but understanding how these things work makes you a better chaperon so that you can keep things from getting out of hand. Checking – This is the process of constantly replaying thoughts. It could be thinking about something you said, or did or didn’t say or do. Regardless of the content of the thoughts, the process is the same. You think about something and then you react to it. Constantly going over things and judging them. Not only do you check your own mind/thoughts/actions but you check others too. It is checking that so often keeps us running around in a circle like a new puppy. Holding- This is like checking on steroids. The process of checking usually doesn’t last too long. As your mind wanders, you check whatever it comes across. Holding is where you refuse to let something go. If someone did something you don’t like, if you’re upset about something, if you are with someone you like you hold on to these things. Holding is what keeps us stuck in a place of suffering. We hold on to things for any number of reasons. However none of those reasons are ever good ones. Making – When we get tired of checking or holding we often float into the realm of making. This is the most esoteric of the rules as it is where we construct the “what ifs” and alternate realities that make our present reality so difficult to deal with. Thinking about something you will do or say tomorrow and then constructing a hundred different scenarios that could play out in response is just one example of making. The process of making keeps us from our situation and robs us of the moment we are in. Making is the process of living in the future or the past. It is often the response to holding. As we hold on to something, we try to think of ways to deal with it. We construct elaborate stories about how we handled the situation with grace and style and our prowess was on display for all to see or we know that when we put our plans into action everyone will be amazed at our brilliance and they’ll immediately come over to our side and sing our praises. When compared to reality, who wouldn’t prefer the worlds we create when we are making? What all of this comes down to is that we make our own suffering. When we check, hold and make thoughts, we experience their effects. The end result of those effects is suffering. That’s why the founding teacher of the school of Zen that I am a part of used to say, “Big mind, big problem. Small mind, small problem. No mind, no problem! Ha ha ha!” Over the past few months, I’ve been doing a lot of checking, holding and making. It’s been so intense that it has kept me from being able to focus on what really matters. It has contributed to my weight gain and robbed me of my motivation to live a healthy lifestyle. It prevented me from sitting in meditation for quite a while too since sitting meant I had to confront all of the checking, holding and making that I was doing. However, I eventually did begin to sit again in spite of my mental state and I began to see how to get things in order. I saw clearly how my mind was working and I have adjusted to stop the cycle and keep a clear and calm mind. My mind still checks, I still hold on to things and I’m still making, making, making but at least I am aware of it now and I have the ability to stop myself instead of trying to chase the puppy around to keep it from peeing on everything. Without someone to chase it, the puppy gets bored and calms down on its own. At least until it sees another squirrel.